A fourth bomb exploded in Austin, Texas, on Sunday, after three other explosions killed two people and injured several others earlier this month. Some people have drawn a connection between the Austin explosions and Ted Kaczynski, the Unabomber who was sentenced in 1998 to life in prison for bombings that killed three people and injured others over the course of nearly 20 years. The series of explosions in Texas has prompted some comparisons to that of Ted Kaczynski, the Unabomber. Kaczynski was charged in a bombing spree than spanned nearly two decades, ending in the mid-1990s. Three people were killed and several others were injured. In Austin, Texas, two people have been killed and several others were injured when package bombs were detonated in various parts of the city. Just after midnight on Tuesday, a package bomb bound for Austin exploded at a FedEx facility in Shertz, Texas outside San Antonio. As of Tuesday morning, law-enforcement officials said they had no suspect in the bombings, but were looking at some persons of interest. So far, a motive for the bombings is unknown. Investigators said on Monday they believe the incidents were orchestrated by a “serial bomber,” after a fourth bomb exploded in Travis County on Sunday night, and said that the bomb was “a little more sophisticated” than what they had seen earlier in the investigation. 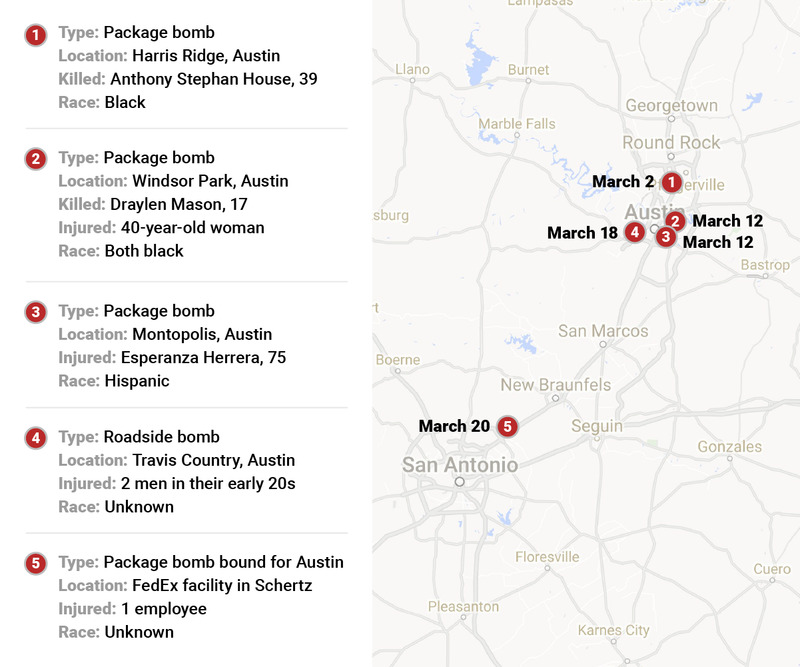 Two people were killed and one person was injured in three bombings throughout Austin since March 2. The bombs has been disguised as mail packages that were left at the victims’ homes. The bomb that exploded on Sunday was rigged with a trip wire that was triggered when two men walked by it. Both men suffered injuries and were hospitalized after the explosion. From 1978 to 1995, Kaczynski killed three people and wounded 23. During this period, he arranged 16 known bombings that targeted mail packages and an aeroplane cargo hold. Much like the bombings this month in Austin, Texas, which police said had increased in sophistication, the explosives for which Kaczynski was blamed were described in the same way. Kaczynski’s motive for the bombings apparently stemmed from his belief that technology was mankind’s undoing, which led him to target university professors and computer stores. He was eventually caught after he sent a letter to The Washington Post and The New York Times under an alias. In the letter, he threatened that the bombings would continue unless the newspapers published his manifesto. After it was printed, Kaczynski’s younger brother notified authorities after noticing similarities between it and Kaczynski’s previous writing. Kaczynski was arrested in 1996 and pleaded guilty in exchange for a life sentence. The Unabomber case and the bombings in Austin are not the only ones to capture national attention. 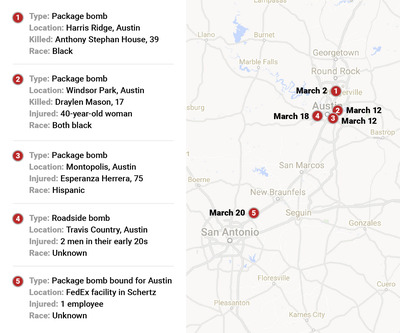 As noted by the Austin-based newspaper, The Statesman, several people have been arrested on suspicion of mailing package bombs in the last 18 months alone. Austin police are working with multiple state and federal agencies to track down the person responsible for this months bombings have asked anyone with neighbourhood security camera footage to notify them. Police have offered a $US100,000 award for tips leading to a suspect in the Austin bombings. The Texas governor’s office is offering an additional $US15,000 award. Anyone with information is encouraged to contact the Austin Police Department’s tip line at (512) 472-8477 (TIPS).